Here's a quick tutorial on making a diorama using a clear model car display case. This one isn't particularly flashy, but was made in a few hours from start to finish. The case is just a clear plastic model car case, they're around $5-$10 from walmart or any hobbyshop, they're stackable, and hold a surprising number of minis. 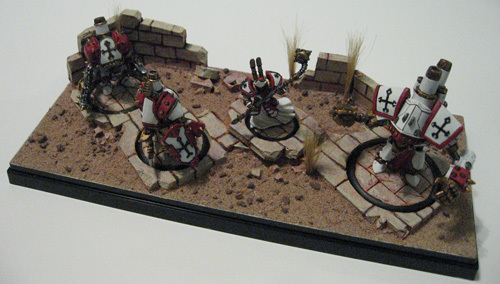 The terrain for this one is made from 1/8" foamcore. A circle-cutter really helps, but you can get by with an x-acto knife and a spare base to use as a guide. You can also add magnets underneath to keep your minis in place, should you decide to transport them using the case. 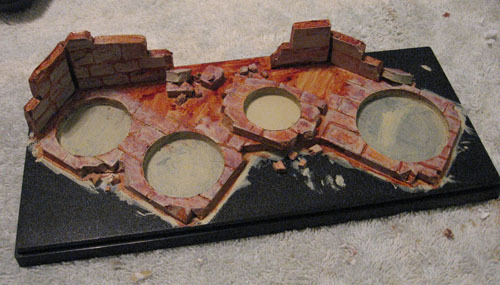 First, just carve out a bit of terrain, for this one I kinda wanted a "ruins" theme to match the flagstone bases on the models. It's critical to mention that many of the clear plastic cases taper slightly, so be sure to fit everything, giving yourself a millimeter to work with around the edge. I bought a spare display case to use as a tester, since you're likely to get paint/glue/scratches on it by repeatedly test fitting everything. Next, a coat of paint. Again, quickly done, so I just painted on the stones, leaving spots that I would be covering with sand flock plain. 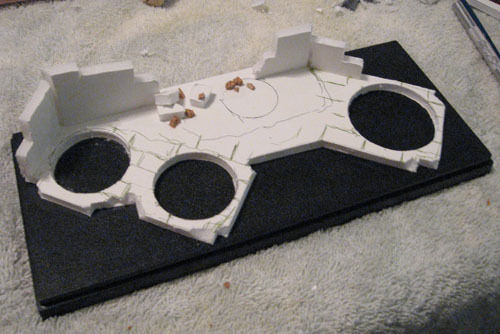 The larger rubble is made from pieces of foamcore, the smaller bits are cork. Last touches are added, (testing the fit of the clear case once again) flock glued down and some grass is added. 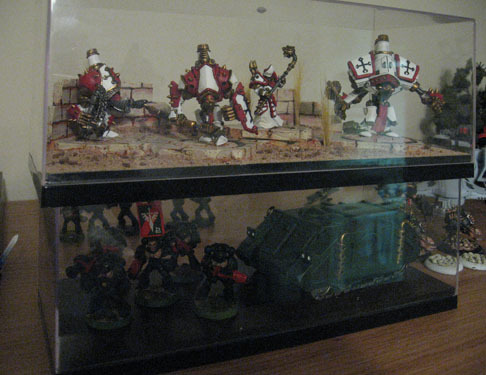 These display cases can hold a full squad of space marines, a warmachine battlegroup, or you can go all out and make a full diorama. They're stackable, which saves a ton of space, and prevent dust from getting on your minis. They're also small enough so you can easily tackle making 2 or 3 in a day. Note that even without using the clear plastic top, they make pretty decent diorama bases! Thanks for the write up. I like the idea and can see me buying a few of these in the near future.